"On Shirley Hager and Agatha Younger"
A brief non-fiction essay about two extraordinary community college women educators who resuscitated my courage to pursue knowledge on my own terms. Published under the pen name, Delia Sebora. In a workshop along the way, a well published trade writer admonished that, of course, 'writers write.' I've been fortunate to share with a community of students, general readers and colleagues some of these works. These publications reflect more than three decades of oral and written literary and cultural historical research, global engagement with scholars and practitioners, and active living in and between West Africa and the United States. Although scholarly, most works are also accessible to the general reader. My creative writing and non-specialist publications invite the curious, eclectic reader, the seeker. A passion for bringing research to life mirrors my public speaking, adventures with multimedia projects, and creative writing. Currently putting the finishing touches on a collection of essays and creative non-fiction along with updating another manuscript, my new focus is the intrigue of genealogy and meandering roads of life in narrative, poetry, and song. This book examines the myths and meanings of an African goddess whose power is complicated by her femininity and maternalism. Using original source materials and field observation, it challenges readers to explore the intersections of spirituality and gender. 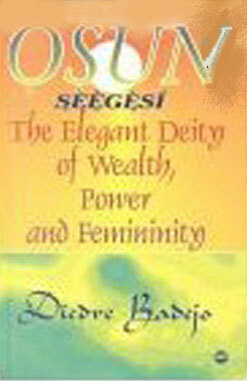 The Osun narrative is recounted annually during its August festival in Osogbo, Osun State in Nigeria. Thousands of people attend the event from many countries around the world. The Osun festival and its related activities intertwine the sacred and the secular into a lively cultural event that reinforces its beliefs and values. Published in "The Mentor That Matters: inspiration from transformative teachers, role models, and heroes," volume 1. Edited by Suzanne Fox. Stories of You Books, 2016: 189-192. "Academe's Guilded Stairway." A chapter in Connecting the Literacy Puzzle: Linking the Professional, Personal, and Social Perspectives, edited by Joanne Kilgour Dowdy and Sandra Golden (2012) reflecting my academic and cultural journey. Asked by Dr. Joanne Dowdy to reflect upon my journey to and within higher education, I contributed one of nineteen essays in her edited book, "Connecting the Literacy Puzzle: Linking the Professional, Personal, and Social Perspectives" (2012). It weaves a narrative of experiences growing up in New York City that continue to influence my world views and engagement with our global and education communities. The book is part of the Chelsea House Series on Global Organizations. It offers insight to the evolution of the African Union from its origins as the Organization of African Unity to the present. Written for mainly for non-specialist readers, the African Union offers background and context for the organization's purpose, structure, mandates, and policies. As a social studies reader, it presents its audience with examples of a few present and future challenges that the AU grapples with and attempts to resolve both diplomatically and organizationally. Yoruba women’s authority is woven throughout the social fabric. This chapter is found in a book titled, Osun Across the Waters, edited by Joseph Murphy and Mei Mei Sanford, and published by Indiana University Press in 2002. The collected songs in this article illustrate how these women articulate that authority. The original Yoruba songs with their English translations are included in the analysis of women's authority and agency in Yoruba society. "African Americans In Thoroughbred Racing." A study of the roles that African Americans played in the evolution on the American side of the 'Sport of Kings.' The monograph is based on archival and historical documents, interviews with retired and active horsemen and women. It illustrates the larger global influence and reach of African Americans in the thoroughbred racing industry. (June 1993). “At the Crossroads of Time." An Essay on August Wilson's Joe Turner's Come and Gone. Providence, Rhode Island: Trinity Repertory Theatre, Humanities Booklet #5, February 1989. "Playing a Blue Note." An essay on August Wilson's Ma Rainy's Black Bottom. Providence, Rhode Island: Trinity Repertory Theater, Humanities Booklet #3, December 1987, 7-11. "Ijapa: The Trickster Tortoise." (Playbill essay), The Trick Track Tales, a performance of Black World Folklore. Providence, Rhode Island: Rites and Reason Theater, Brown University, May 1986, 3. "A Giant Statement", a review of Soyinka's 'A Play of Giants', Yale Repertory Theater. In Hantu: Newsletter of the New England Regional Conference on Black Studies. 6,2 (Spring 1985), 4. "In My Opinion" written as tribute to USC Dornsife's Joint Educational Project (JEP), and its impact on me as an undergraduate student-tutor at USC in this community-based program. In this segment, MHC Board member Dr. Diedre Badejo reflects on the intricacies of West African language, culture, and the changing role of women.